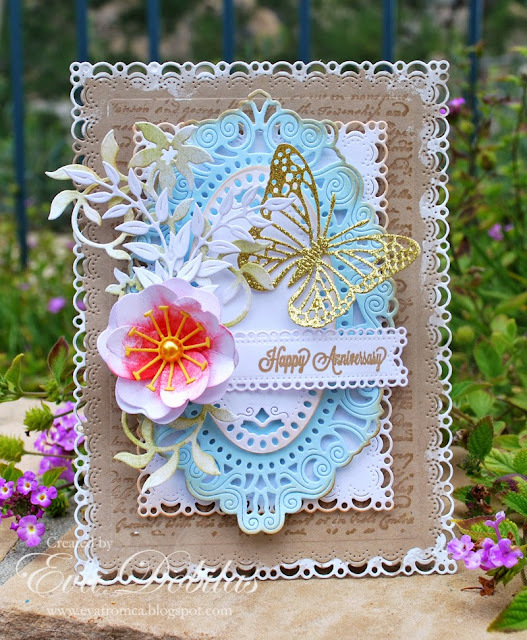 Hi there, today I am sharing a pretty Anniversary card using gorgeous Cheery Lynn Designs dies. 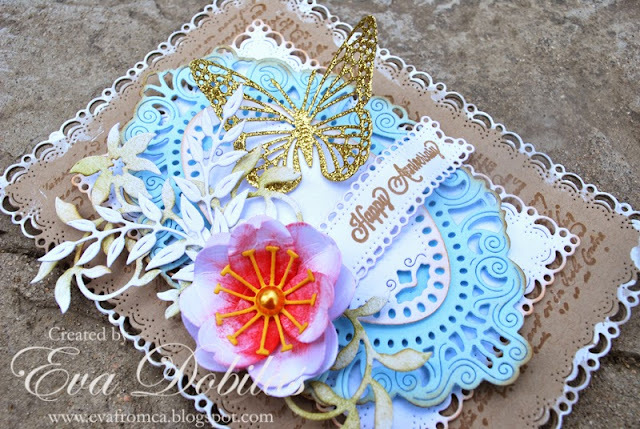 To create my card base I used Horizon Rectangle Boutique Stacker Frames and die cut two of the largest dies out of kraft card stock. I stamped it with JustRite Papercarfts Script background stamp. I die cut a smaller Horizon Rectangle Boutique Stacker Frames out of white card stock to layer on top of the card base. Than I die cut the Mirror Mirror Doily Frame out of aqua color card stock and the inside part of it out of white card stock and layered them on top of each other. To create the flower I die cut the flower our of the Build a Flower #3 and also used the Embellishments #3 for the inside of the flower and added a yellow pearl in the middle. I die cut a Leafy Flourish and Olive Branches out of white card stock and using Ranger inks I sponged a little color on, which I did the same on the flower and strategically placed all of them on my doily. I die cut one Horizon Fishtail Banners and stamped my sentiment onto it by JustRite Papercrafts and adhered it onto my doily with the flowers and finally I die cut of the butterflies from the Small Exotic Butterflies #2 out of gold glittered card stock and once again I added it to my doily. As a final touch I added some white gesso on the edges of my card base. Thanks for stopping by and good luck to everyone for entering our Weekly Challenge with a chance of winning a $20 spending spree at Cherry Lynn Designs.